Characteristics and actions of LH and FSH are discussed in Chapter 13; however, brief space will be given to a discussion here. Structural considerations have also been discussed. There are similarities between LH, FSH, CG, and TSH, all of which contain an identical a-subunit. FSH and LH bind to membrane receptors in their target cells and couple to G proteins through conformational changes in ligand-receptor structures that avail specific sequences in the bound a-subunit similar to AVP (arginine vasopressin) or oxytocin in sequence and also in the receptor for the interaction with the cognate G protein. The result is to activate adenylate cyclase and increase the cellular content of cAMP. FIGURE 5-35 Speculative model of a single TSHR that binds to different G proteins. The two species are in equilibrium; this equilibrium is assumed to include a receptor molecule with no G protein bound. One species is proposed to have a higher affinity than the other, that coupled to Gs; this species is linked to hormone-increased cAMP levels and is presumed to be lower in number than the TSHR molecules coupled to Gq. The higher capacity of the GQ-coupled receptor is signified by a larger number (two) of these forms. The GQ-coupled receptor has a lower affinity for ligand and is coupled to the inositol phosphate (IP) signal cascade. The equilibrium between the two forms is suggested to be set by the Pi-purinergic receptor via G^ the regulation of Gi is further suggested to involve ADP ribosylation. The model suggests that the "precou-pling" of the different G proteins induces different conformations in the extracellular domain, as represented by the hatched and dark boxes versus the open circles in TSHR with no G protein bound. The blocking TSHR autoantibody (TSBAb) site is a high-affinity antagonist TSH-binding site that involves tyrosine 385 and residues 295-306 and 387-395, particularly cysteines 301 and 390. The thyroid-stimulating autoantibody (TSAb), which increases cAMP levels, interacts with an agonist site on the extracellular domain; this site involves threonine 40 and residues 30-33, 34-37, 42-45, 52-56, and 58-61. After interacting with these sites, TSH or the TSAb is presumed to transmit its signal to the transmembrane domain; the two exoplasmic cysteines critical for this process are noted. The stimulating autoantibody that increases cAMP levels might not be identical to the stimulating autoantibody activating the PIP2 signal. The mechanism by which Gj regulates the equilibrium is unknown. Reproduced with permission from Kohn, L. D., Ban, T., Okajima, F., Shimura, H., Shimura, Y., Hidaka, A., Guiliani, C., Napolitano, G., Kosugi, S., Ikuyama, S., Akamizu, T., Tahara, K., and Saji, M. (1995). Cloning and regulation of glycoprotein hormone receptor genes. In "Molecular Endocrinology" (B. D. Weintraub, ed. ), pp. 133-153. Raven Press, NY. The interaction between the a- and /3-subunits of the hormones appears to be noncovalent, consisting minimally of hydrogen bonding. Essentially, the free subunits are inactive and must be combined as the a / /3-heterodimer for biological activity. Since the a-subunit of all of these hormones is interchangeable, the /3-subunit clearly specifies the biological activity of the hormone and accounts for specific binding to the cognate receptor. Accordingly, the /3-subunits of LH, FSH, and TSH are encoded by separate genes; however, there are multiple genes that encode /3-subunits for CG in the placenta, and some of these arise through alternative splicing. The a- and /3-subunits are each stabilized by disulfide bonds, and disruption of these bonds by reducing agents alters the internal configura tion and causes dissociation of the heterodimer. Specific domains of the subunits that define the sites interacting with the receptor are not yet known, although specific amino acids, such as lysine 91 of the a-subunit and aspartate 99 of the /3-subunit, are required for signal transduction and they could be involved in the interaction of the dimeric hormone and the receptor. Both of the subunits contain carbohydrate moieties (see Figure 5-9), and both O-linked and N-linked carbohydrates have been found in the a- and /3-subunits. N-linked carbohydrate substituents on the /3-subunit probably are not important for signal transduction. 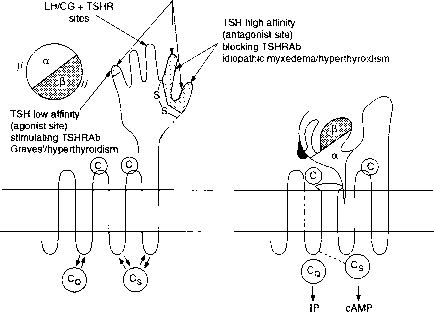 FIGURE 5-36 TSHR expressed in the configuration of a hand with fingers waiting for ligand and attached to the transmembrane domain (left). After interacting with ligand, the TSHR undergoes a conformational change that now pushes the ligand onto the exoplasmic loops of the transmembrane domain. This induces the G proteins on the cytoplasmic surface to activate the transducing signal pathways. The hormone is depicted with two subunits; it is assumed that the /3-subunit is the primary surface interacting with the extracellular domain (the hand and fingers) since it generates tissue specificity. The a-subunit is presumed to interact with the transmembrane domain and undergo a conformational change. An important peptide interacting with the transmembrane facet may be one common to all glycoprotein receptors and related to the nonapeptide hormones oxytocin and vasopressin. Reproduced with permission from Kohn, L. D., Ban, T., Okajima, F., Shimura, H., Shimura, Y., Hidaka, A., Guiliani, C., Napolitano, G., Kosugi, S., Ikuyama, S., Akamizu, T., Tahara, K., and Saji, M. (1995). Cloning and regulation of glycoprotein hormone receptor genes. In "Molecular Endocrinology" (B. D. Weintraub, ed. ), pp. 133-153. Raven Press, NY. ate cyclase. Receptors in this group have a large extracellular N-terminal domain and a small cytoplasmic C-terminal domain. Because of the similarity of the LH and FSH receptors to those for the catecholamines and their interaction with G proteins and subsequently adenylate cyclase, it is surmised that FSH and LH signal transduction may be similar to that for the catecholamines, about which more information is available. Accordingly, the ligand binds in a pocket generated by the transmembrane domain and then leads to a change in shape as similarly portrayed by the TSH receptor. This conformational change would allow the bound a-subunit (AVP-like sequence) plus domains of the receptor to make contact with a G protein as the first step in the signal transduction process. LH and FSH are probably functional in the signal transduction process as homodimers by analogy to the TSH receptor. Another theory is that glycoprotein hormones have disulfide isomerase activity and that signal transduc tion could be triggered by the alteration of one or more disulfide bonds in the receptor. 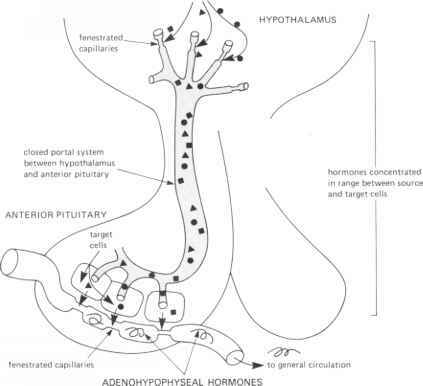 While LH receptors are usually considered to be located in the gonads, they have been detected in the uterus where they could interact with the high level of CG in pregnancy.